Hands up if you wore camo in the 90s? I’d normally aim that question at women of a certain age (ie: old like me), but camo gear was so ubiquitous at one point in the 90s that even if you weren’t born until that decade, chances are you wore it. As a onesie. I was living in the UK in the mid 90s and remember music festivals that looked like army recruitment events there were so many camo camisoles and jackets in the crowds (I blame Scary Spice – look at her here). What was it all about? I love fashion history and smart people who analyse how certain trends are connected to broader social movements, and I occasionally wonder what they have to say about camo and the 90s. What inspired this weird moment in fashion when we dressed like we were about to throw ourselves in a ditch and fire off a few rounds? I’m proud (smug) to say I never bought into the camo thing (wish I could say the same about cargo pants), I just always felt a bit uneasy about its associations. And khaki ain’t my colour. Fast-forward a couple of decades to 2017, I was happily fabric shopping in Japan and stumbled upon this amazing Kokka cotton/linen print (it’s here at Miss Matatabi, but sold out in this colourway). It was late in the day, our fabric baskets were full and to be honest I don’t even think I looked at the fabric properly – I was so in love with the colours I added the roll to the pile and checked out a couple of metres without a second thought. Later that evening, we were back at our tiny little Tokyo Airbnb admiring our purchases and I pulled out the Kokka, spread it out, and realised with a slightly sinking feeling I may have just bought a piece of very colourful camo. Klarissa confirmed my fears when she labelled it ‘lady camo’. I’d be lying if I said I didn’t instantly love it a bit less. So my rainbow camo sat at the bottom of the fabric pile for many months, with those glorious colours peeking out occasionally to tempt me. SUCH a good mix of colours! But every time I considered a pattern, the fear would set in… Would I look like a bad 90s throwback? A war-hungry weirdo? A middle-aged Spice Girl? 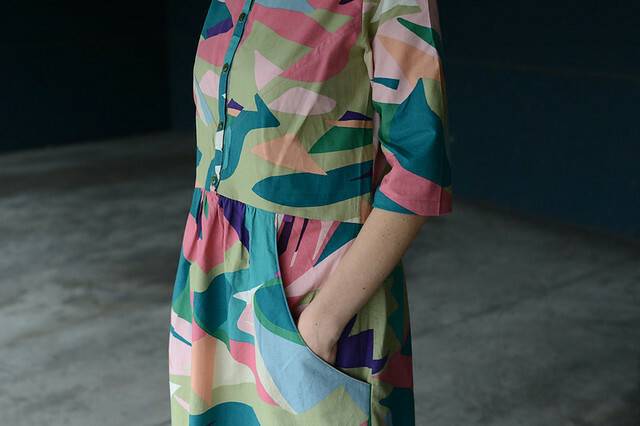 Then late last year Marilla Walker released the Isca Shirt Dress and I knew I’d found the pattern for my camo. Although the samples for the Isca launch were plain fabrics (to better show off those awesome seam details), I figured it could work with a crazy print too because the lines are so nice. I love the close fit at the shoulders and the looser waist, the subtle dip in the waist at the back, those pocket curves and sweet skirt gathers and three quarter sleeves. I love it all. 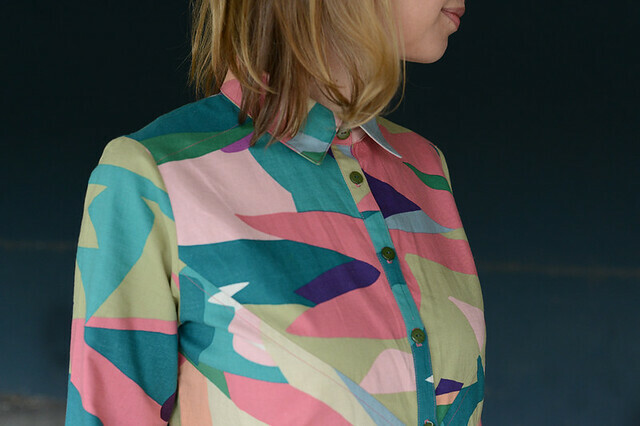 Teamed with such a cool, modern, clever shirt dress pattern, surely my fabric couldn’t look sad 90s if it tried….? So I bought the pattern. I made a toile. And I started cutting the glorious colours…. Making this dress was so much fun. The pattern instructions are some of the best I’ve come across, everything is explained really clearly and there’s zero confusion piecing all of those bodice bits together. 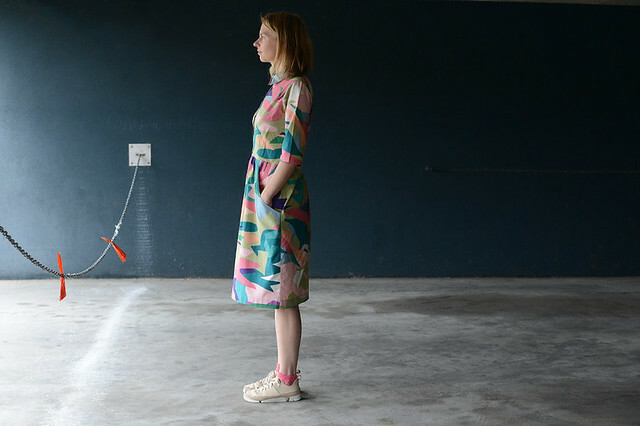 The version I made (Dress A) uses felled seams which are such a lovely, neat way to finish a seam and add extra stitching detail – it’s the first time I’ve tried this technique and I’m tempted now to fell seam everything. I sewed a size 5 and lengthen the skirt and added almost two inches to the bodice as it’s drafted for a much shorter body than mine and I’m pretty long in waist. I do wonder if I went overboard as I think the waistline should be slightly higher – if it keeps bothering me I’ll take it up a bit. I also ended up taking in an inch at the sides of the dress as it was a bit wider than I wanted – in a drapier fabric I don’t think it would have mattered but this fabric keeps its shape and I wanted a slightly narrower shape. 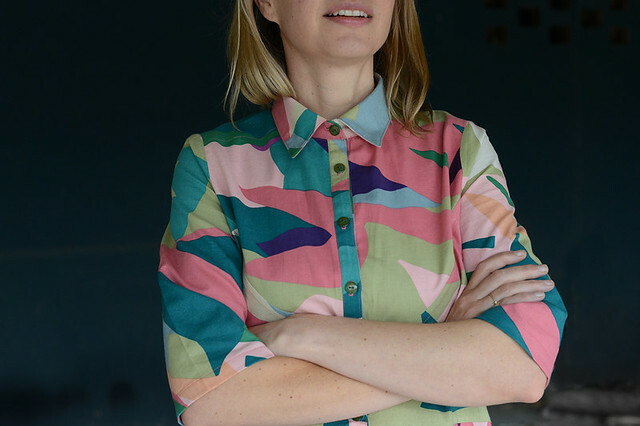 I am not sure how this would act as camouflage–unless you were conducting military maneuvres in front of a very colourful urban mural?–but I love it! 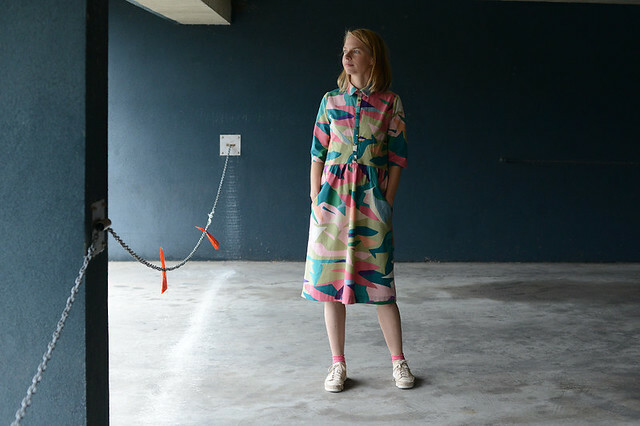 You can’t go wrong with a shirt dress and this pattern and fabric are a wonderful match. I’m afraid I had a shrunken green army t-shirt in the 90s that I wore with hip hugger flares and some orthopaedic looking brown suede lace-up shoes. Camo or not, simply beautiful: the fabric, the dress, the sewing, the pictures….! Now I want to sew this pattern too! I’m getting cool print vibes without even hint of cameo. I love this dress & are now tempted to try the pattern… oh that sewing list of mine is seriously long! No I don’t think camo, just graphic fabulousness. Love it all. Looking FAB! Fantastic pattern in fabric and pattern. Going to make one too!